The Atlantic Canada Travel Trade Readiness Program equips tourism operators with tactics, processes and best-practices on how to develop and expand your business through travel trade. 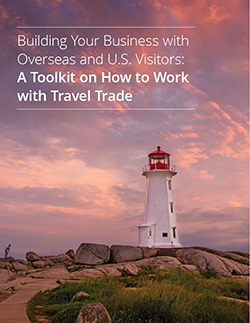 The information in the toolkit, combined with advice and assistance from Tourism Nova Scotia’s market development team and travel trade readiness workshops, can assist you in growing your business. The Atlantic Canada Travel Trade Readiness Program was developed through a partnership between the Atlantic Canada Opportunities Agency and the tourism development organizations for the four Atlantic provinces. For an introduction to working with travel trade, watch this introductory webinar (length: 1 hour) produced by Hospitality Newfoundland & Labrador. Subscribe to the inTouch newsletter to receive notice about upcoming travel trade readiness workshops. For more information about the Atlantic Canada Travel Trade Readiness Program, please contact our market development team. Please fill in the form below to access a copy of the 2018 Atlantic Canada Travel Trade Readiness Toolkit. I would like to be contacted by Tourism Nova Scotia for follow up and further Travel Trade information.